How Much Weight Can You Put in a Dumpster? Weight limits for temporary dumpsters vary based on the type of debris you’re throwing out and the size of the container. Ten tons, or 20,000 pounds, is the max weight that the average dumpster truck can haul, but limits will often fall between two and six tons, or 4,000 and 12,000 pounds, to meet local road safety restrictions. Overfilling your dumpster can result in overage charges, so use this guide to help you find the right size container to avoid exceeding your weight limit. 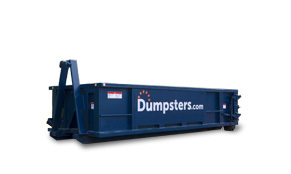 What’s the Weight Capacity for Each Dumpster Size? We provide a generous weight limit for each of our container sizes, allowing you to toss debris from a wide range of projects, from home cleanouts to large-scale remodeling jobs. 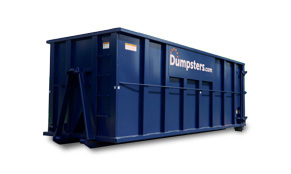 If you have questions about finding the right dumpster for your project, give us a call. How Much Does a 10 Yard Hold? 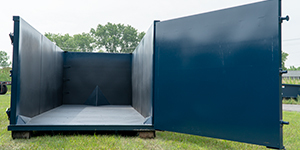 A 10 yard container typically holds 2-3 tons or 4,000-6,000 pounds. * But if you're getting rid of materials like concrete or brick, you can rent a special heavy debris dumpster with a 10 ton weight limit. How Much Does a 20 Yard Hold? How Much Does a 30 Yard Hold? How Much Does a 40 Yard Hold? *Exact weight limits may vary by location and type of debris. Weight is a major factor in the price of your dumpster, since landfills charge a fee per ton for dumping. After we pick up your container, your debris is weighed at the landfill and the cost is calculated based on their fee structure. 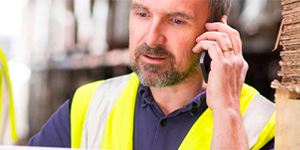 To make budgeting easier, our flat rate pricing includes disposal costs for a specific weight limit. As long as you don't exceed that limit, this means you’ll know what you’re paying upfront—no need to wait and wonder until your debris gets to the landfill. How Much Does an Empty Dumpster Weigh? 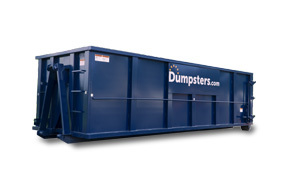 An empty dumpster weighs between 3,750 and 6,500 pounds, depending on the size of the container. But don’t worry, the weight of your dumpster isn't factored into your weight limit. How Is Your Dumpster Weight Measured? 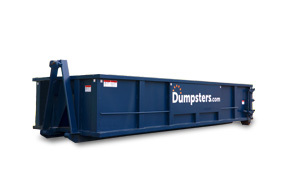 The dumpster is weighed when it enters the landfill and again after the debris is dumped. The difference in weight is then used to determine the cost of disposal. How Do I Know What My Debris Weighs? Our team will ask questions about what you’re tossing to help you gauge the weight of your debris and rent the right bin size. 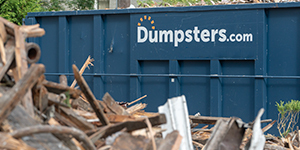 You can also use our handy dumpster weight calculators to get an estimate. We’re here to make sure you find the right container to handle the weight of your debris. Here are three basic tips to avoid overloading your bin. We'll help you choose from our range of container sizes to find the best fit for your project, so you won’t have to worry about exceeding your weight limit. 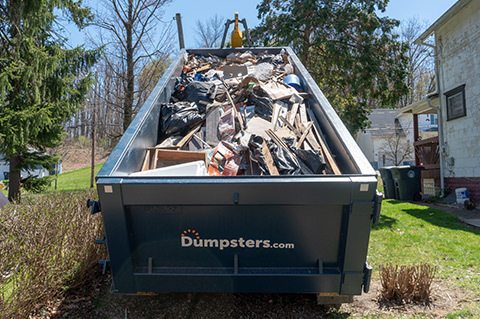 Our easy-to-open doors allow you to fill the dumpster evenly and our team will tell you how high to place the type of debris you're tossing so you don’t overload it. With our flat rate pricing, you’ll know what you’re paying upfront. But if you have more debris than you anticipated, our expert team is just a call away.